Dr. Smith's ECG Blog: A Young Woman with A Wide Complex Regular Tachycardia. A Young Woman with A Wide Complex Regular Tachycardia. A woman in her early 30s with no past medical history presented with palpitations. She had no chest pain, SOB, shock, hypotension. She felt otherwise well. How would you treat this patient? Far less important: What kind of regular wide complex tachycardia is it? You have a minute to think. If it is VT, you won't hurt her by giving adenosine, and it is AVNRT or AVRT, it is likely to successfully terminate it. If at any time she becomes unstable, then electrically cardiovert. She was given adenosine and she converted to normal sinus rhythm, with a subsequent normal ECG (not shown). --Was it VT, and the conversion was just coincidence? --Or did she have AVNRT or AVRT, and the termination at the time of adenosine was causal? --Or something else, like Fascicular VT? What do we get from analysis of the ECG? a) In the precordial leads, the QRS width is only 120 ms, which among VT cases only happens in fascicular VT. In non-fascicular VT, the initial part of the QRS must travel through slow conducting myocardium, and the QRS, especially the beginning of the QRS, is slow. b) In the precordial leads, from the onset of the r-wave in V1 and V2 to the nadir of the S-wave is only 40 ms, which is very fast for non-fascicular VT. Among VT, only fascicular VT would have a such a rapid initial deflection. --negative QRS in V1 (LBBB type). This is VT at least 90% of the time, but not 100%. b) The QRS duration in the limb leads seems to be about 140 ms. So why is the QRS 120 ms in precordial leads, and 140 ms in limb leads? And what is the QRS duration actually? The QRS duration is the longest QRS duration of the 12 leads. Shorter durations can be due to recording angles. In this case, the frontal plane (limb leads) is more able to capture the entire QRS duration that the precordial leads. So the QRS duration is closer to 140ms, and the initial deflections are longer than 40 ms, so VT remains in the differential. What VT responds to adenosine? Right ventricular outflow tract VT, also known as Repetitive Monomorphic VT (RMVT). RVOT originates from the "base" or top of the heart and thus has and LBBB morphology (as here), but also an upright R-wave in all inferior leads (unlike this ECG). So this is not RVOT, at least not typical. The other common "idiopathic" VT is Posterior Fascicular VT, which originates in the posterior fascicle, and thus has an RBBB/LAFB morphology. It responds to verapamil. Here is one case of Posterior Fascicular VT. Here is a 2nd case of Posterior Fascicular VT. In reality, fascicular VT can originate in any fascicle (anywhere in right or left bundle, etc.). Re-entrant rhythms can originate anywhere (they only require a second pathway with a different conduction velocity and refractory period). All of them will be narrower that VT that comes from a structurally abnormal heart. Any of them can (rarely) respond to adenosine. The "idiopathic" VTs occur by definition in structurally normal hearts and have a relatively benign prognosis. 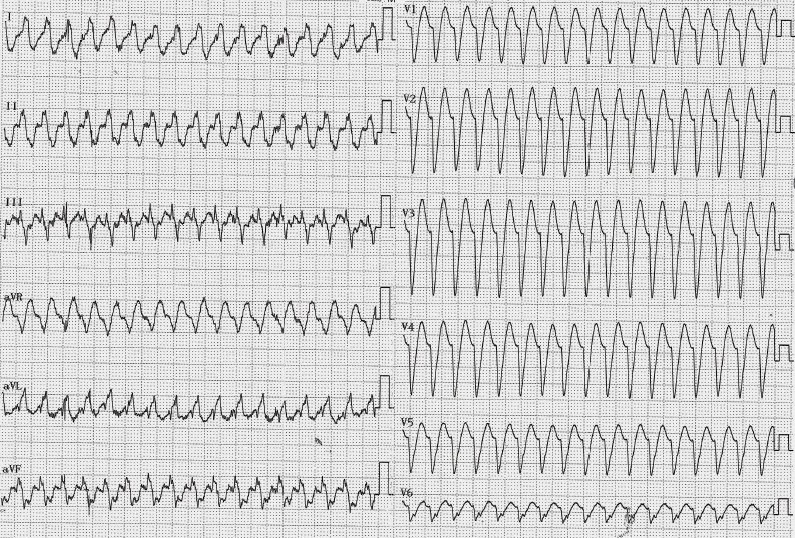 This is a rare non-RVOT fascicular VT that responded to adenosine. It will require EP testing to confirm. Consider in the context of clinical scenario. And then consider the ECG. 1. The longer the QRS, the more likely it is VT. A QRS duration greater than 140 ms is likely VT, though it is not a terribly reliable differentiator. However, a QRS duration of 200 ms is almost always VT or aberrancy with hyperkalemia. 4. Leads V1-V6 unidirectional (no RS or SR) and "concordant" (in the same direction)? Then VT (but in this case concordance is less convincing because the QRS duration is only 120 ms.
----a normal RBBB or LBBB pattern makes SVT very likely: both have a rapid initial deflection, the r-wave in LBBB and the rS in RBBB, followed by a slowly conducting latter part of the QRS. a. If there is LBBB pattern, is the initial r-wave greater than 50 ms? Or is the onset of the QRS to nadir of the S-wave in V1-V3 greater than 60-70 ms? If so, this is not true LBBB. b. If there is RBBB pattern, is there a monophasic R-wave? Or is the first R of the Rsr' larger than the second one? Then VT.
Voltage calibration in the precordial leads (5mm i.e. 0,5 mV) seems to differ from the one in the limb leads (standard 1 mV). While it doesn't greatly affect the VT's morphology, I was just wondering whether it was intentional in this case. Olivier, I didn't even notice! Thanks for picking that up. It should only affect the voltage and should not make a big difference in the ECG diagnosis. Had they been the same, the precordial lead complexes would have been of greater voltage. Dyspnea on Exertion in a Middle Aged Woman.